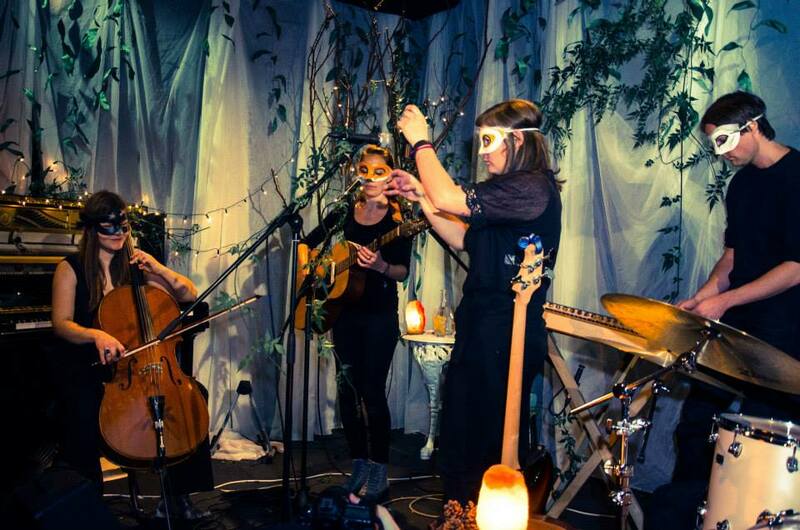 Fox Owl Crow merges different genres from art-rock, folk to prog-rock. Formed a year ago by Suzanne McEnaney (guitars/multi-instrumentals/vocals), it was her talent that attracted the other highly talented multi-instrumentalists to the show: Sebastian Boes (drums/hammered dulcimer/glockenspiel), Carol Faherty (guitars/multi-instrumentals/vocals) and Frieda Freytag (cello/piano). Arriving into the space, the setting was intimate and some audience members were wearing venetian masks. Lights were dim and the stage was dressed like a scene from a wood with small sparkling little lights. Support music came from The Trash Blues who were great. After Fox Owl Crows set, I thought about these guys a lot, and would love to see them play again, only the next time wearing some old style costumes or top hats. It would add to their set, because it felt like they were transported from some old bar from the 1800s. Opening with two acoustic songs, Fox Owl Crow grouped wearing masks. Boes on drums was behind a wolf mask. It was so intriguing listening to the initial songs, as there were nerves, then something amazing and mind blowing happened. They moved from acoustic to electric with several loops and ambient beats. The electric sounds were more versatile, and Fox was more comfortable with electric; tuning the acoustic guitar is timely. In these songs, I could hear elements of Ane Brun, Agnes Obel to the ambient songs of Sigur Ros, even some elements of Tool and the Beatles, forming their own sound. Quirky, enjoyable, and sometimes I was shocked because the sound was flawless and incredibly inspiring. My favourite songs are ‘Breath’, ‘Feed Yourself’, ‘Ghosts’, and ‘Cloud Song’. Bewley’s Cafe Theatre was a perfectly fitting venue for the show. Once Fox Owl Crow got into the groove, they were simply exceptional, outstanding and a hard act to follow. It is hard to believe Fox Owl Crow are only on the go for one year, as festivals and events are waiting for them. As for the masks, I wanted one. Maybe audience members can wear masks next time. After the encore, I wanted more and I’m sure anyone who went felt the same too. We didn’t want the night to end. Check out Fox Owl Crow here on Soundcloud.